How about a trip back into summer 2013? I know we've all become familiar with KBShimmer's early summer releases for this year, but last year KBShimmer was rocking it for summer too. This shade was part of the collection last year, and it's not one you want to forget about! 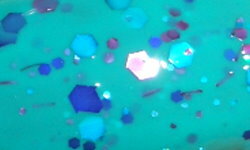 Totally Tubular is a bright turquoise blue-green crelly with blue, aqua, and fuchsia glitters. Color: Gorgeous color! I love a great tropical ocean blue-green for summer. The glitter in this is compliments the base perfectly. Formula: The formula on this was good. I used 3 coats in this swatch. I will say I found it a little difficult to get the larger glitters on the nail. Overall: Awesome ocean-like fun blue for summer. The color is great and the glitter makes it pop. The formula is good, but I wish I could of got some more of the larger glitters on my nail. That was definitely not a deal-breaker though, and I think this would be an awesome addition to your summer polish stash.